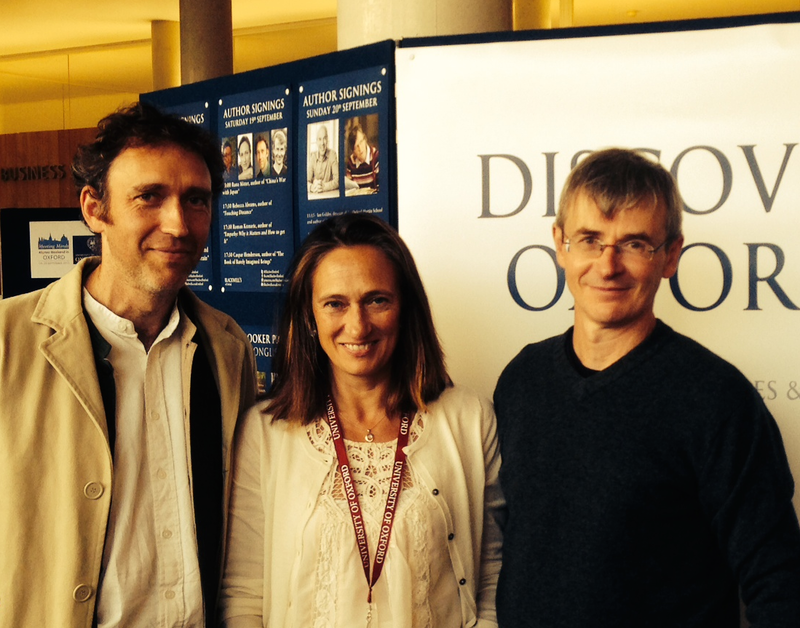 On 19 September 2015 I took part in a panel discussion presented by Blackwell's Bookshop at the Oxford Alumni weekend with the writers Rebecca Abrams and Roman Krznaric. Our topic was "Varieties of Wonder." I was asked to open with a few comments, and spoke for about eight minutes. Here is a lightly edited transcript of the script I used when I spoke. I’ll start by distinguishing wonders: strange and marvellous things; from wonder: an experience or state of mind. I’m going to talk for a few minutes about the second these — wonder as an experience or state of mind. I will touch on three things: some definitions of wonder; the deep history of wonder; and the significance of science and technology. It shares characteristics with but is not the same as curiosity. For Descartes (Passions of the Soul, 1649) ‘Wonder is a sudden surprise of the soul,’ reserved for what is rare and extraordinary. It is the first of the passions, the only one unaccompanied by fluttering pulse or pounding heart. Disinterested but not indifferent, wonder is a cool passion that fixes on objects for what they are, instead of what they are for us. [Wonder is] an attitude of altered, compellingly-intensified attention towards something that we immediately acknowledge as somehow important – something whose appearance engages our imagination before our understanding but which we will probably want to understand more fully with time. The origins of the word are unknown (beyond the fact that it is from proto-Germanic ‘wundran’). I think ‘wonder’ is used in a completely modern sense in Shakespeare’s late works, The Tempest and The Winter’s Tale. I can't help feeling that [this behaviour] is triggered by feelings of awe, wonder that we [humans also] feel. The Chimpanzees' brains are so like ours. They have emotions that are similar to or the same as those that we call happiness, sadness, fear despair and so forth. Incredible intellectual abilities that we used to think unique to us. So why wouldn't they also have feelings of [a] spiritual kind which is really being amazed at things outside yourself...I think chimps are as spiritual as we are but they can't analyse it, they don't talk about it. They can't describe what they feel. You get the feeling that it's all locked up inside them, and the only way they can express it is through this fantastic rhythmic dance. Set aside for a moment the possible significance or relevance of chimpanzee behaviour, and whether you accept Goodall’s interpretation of what she saw. There is evidence that humans were capable of states of mind commensurate with wonder a very long time ago. We know for example that that Homo sapiens and our cousins the Neanderthals were performing ritual burials for their dead 100,000 years ago. This indicates they were capable of symbolic thought. In important ways, their dreams were like ours. Jumping forward to the the written record, it’s clear that awe was and is associated with visions of the divine in many cultures. Two striking examples come from The Book of Job and The Bhagavad Gita, both of which were probably first written down in the 4th century BC. We may relate to these old texts as literal truth, as metaphorical truth, as poetry. But the context in which we do so has changed utterly since they were written. The Scientific Revolution of the seventeenth century and all that followed from it transformed the way we experience, imagine and remake the world — and so what we wonder at. Science makes possible forms of experience that are in some respects unprecedented in human history. To cite Heidegger, technology is not simply a historical accretion of machines; it is “no mere means”, but “a way of revealing”. That is true enough, but the impact of the scientific revolution and the technology it has produced go further than this, and is more subtle and complex. Science has enabled us to conceive new kinds of stories. For Aristotle the world was eternal and unchanging. In Christian eschatology, the world is closed within a circle of God’s plan. But in the wake of the Scientific Revolution (“the discovery of ignorance”) no ‘story’ is eternal (though it may be very long! ), nor, if it is really scientific, is it a closed system which explains everything. As you’ll know from debates about climate change and other environmental issues, there is overwhelming evidence that human activity is perturbing Earth systems on a large scale. Among the possible consequences is the destruction of natural wonders on a scale unknown in the history our species. Almost certainly, a lot will change. What future wonders will we create, or re-create? What varieties of wonder might there be in twenty, fifty and a hundred years time? If you look at past attempts to predict the future it suggests caution about our best guesses today. Still, I invite you to consider, what new wonders may await? Photo: Roman Krznaric, Rebecca Abrams and Caspar Henderson. Credit Blackwell's/Zool Verjee. Marilynne Robinson is brilliant and to think that she and Kim Davis inhabit the same religion is bizarre and truly American.